Matchday live text commentary blog as Chelsea travel to the Czeck Republic in the Quarter-final of the Europa League, Joe Lightfoot reports. It has been a pleasure to bring to you tonight's action. All of Vavel's post match content will be available on the homepage in the coming hours to view to your hearts content. 'Til next time. After tonight's match will Chelsea be able to kick on in the second-leg? "I’m really happy with the result, and also with the performance. "In this moment we are able to suffer, and in the past we were not able to suffer in the difficult moments of a match. "In the past when we were in trouble, we immediately conceded a goal. Now we are able to stay in trouble to fight and to suffer without conceding anything. "Now we need to think the second leg will be difficult. These opponents are also very dangerous away, like against Genk [where they won 4-1]. We need to be careful. "At the beginning of the match I wanted him [Hazard] on the bench, because I thought probably the match would be very difficult and probably I would need to use him. But if we were 1-0 up at the end of the first half I wouldn’t have used him." Sarri won't be overly impressed with his teams performance but will be satisfied with the result. His players will have to play a lot better if they are to totally ensure they go through to the Semi-final. Slavia Prague gave a good account of themselves. Driven by their immense supporters, the Czech side were the first team to really take to Chelsea in the competition and will head to England with a certain degree of confidence. Chelsea's starting midfield just didn't cut it. 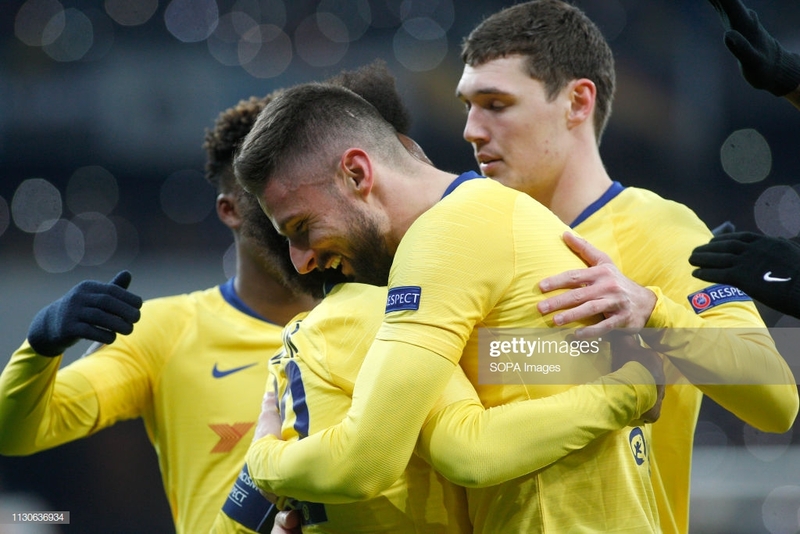 Jorginho, Barkley and Kovacic provided no link to Giroud who fed off scraps all night. There was a lack of creativity and while Chelsea were able to keep another clean sheet, they weren't able to please their travelling supporters with some good football. Hazard is quite clearly the key to an awful lot of Chelsea's problems. Whilst not being involved directly in the goal, his presence alone was enough to inspire his fellow players who instantly looked more creative after he was called upon. Chelsea have won the match but not the tie. They were forced to use their substitutes and were matched by Slavia Prague for the most part of 90 minutes. Not what they would have wanted but they head to Stamford Bridge with a one goal advantage. There will be +4 minutes of added time. Here is a fancy graphic to prove it. GOAAAAL! Chelsea take the lead! Willian's pin-point cross finds Alonso who heads down into the ground and into the bottom left hand corner. He hasn't had the best of games but he has given his side a crucial away goal. A single goal will be enough to win the match but this tie will most certainly not be settled on the sound of the final whistle. Save! Kepa flaps at a looping cross but makes amends with a strong save to deny Boril. The Chelsea goalkeeper hasn't looked convincing in dealing with crosses all game. The net bulges for the first time in the match. Jorginho's effort is ruled out for offside. At least we can say the ball has hit the back of the net... that's something isn't it? Chelsea make their third and final change. Barkley makes way for Loftus-Cheek. Chelsea clearly in need of a goal. There is a sudden resurgence from the home side! After a short breather they have once again taken the game to the competitions favourites. Save! It takes a strong glove from Kepa to deny Traore who broke through the midfield. It was a save that would be expected of the young goalkeeper but certainly one he had to make. Substitution. Kovacic makes way for Kante. Chelsea are turning to their top players in an attempt to win this first leg. Chelsea are looking more comfortable as the game goes on. There is far more movement off the ball and a bit more quality on it. Chances! Rudiger forces the best save of the match from Kolar after a powerfully volley from inside the box. Willian then found space and sends a shot that whistles past the far post! Dramatic couple of minutes here! The Hazard effect? Substitution. Here he is... Pedro makes way. A first change for the Blues, @hazardeden10 is on for @_Pedro17_. Hazard is getting ready. This is not a drill. The main man is READY! Sarri is forced to introduce the winger when he otherwise might not have wanted to. Chelsea earned their first corner of the match and as a result Giroud had his first half-chance. His first-time shot dribbled wide of the target. Underwhelming describes most things Chelsea do it this stage of the match. Ngadeu-Ngadjui forces a rare save from his own goalkeeper Kolar after a deflection from Alonso's cross. Chelsea have started the second-half a little better than the first... not that it took some beating. Second-half is underway. Neither side feel the need to make changes. Chelsea need to improve. Prior to kick-off, a small minority of the travelling Chelsea fans were filmed singing discriminatory chants and involved in anti-social behaviour. The first half ends goalless. Trpišovský will be the happier of the two managers. Masopust is making life hard for Alonso and looked to break free before Rudiger stopped him in his tracks. Kepa's distribution has been poor. Not for the first time in the match, the Chelsea keeper has looked for a cute pass and misplaced it. This has only incited the home side to push up the pitch and apply even more pressure; they have the first corner of the game. If Chelsea are going to get a goal it will most likely come from Willian's involvement. The Brazilian has been the only player looking to drive at the Slavia Prague defence and has found spaces on the left-wing. It is a cold night in Prague but is it enough to ice over the pitch? It would seem so. Kral becomes the latest victim to slip on the pitch... there have been a fair few. Sarri is up and down on the touchline, clearly enraged by a couple of refereeing decisions. Him and Zola are both in the ear of the fourth official. The chance seems to have given Chelsea a bit more belief. Willian and Barkley, in particular, have grown into the match on the left-hand side. CROSSBAR! The first real chance for Chelsea came from nothing. Pedro found Willian who smashed the bar from 20-yards out. Biggest chance of the match so far may give Chelsea a much needed boost. The Chelsea defence are again forced to foul the opposition. Stoch's resulting free-kick is poor though. Sevcik's powerful long range effort forces a save from Kepa who gathers the ball at the second time of asking. Chelsea are second to everything at the moment. Kovacic and Alonso are the main suspects and want way too much time on the ball. They have both been caught out on multiple occasions. WOW. What an atmosphere from the home support. The noise is enough to intimidate any club. Chelsea are clearly looking to play out from the back. Slavia Prague are making this difficult with an extremely high press. A long ball to Giroud would take the considerable pressure of the Blues' defenders. Chelsea have settled now. Barkley has had their first effort. Though, it is fair to say he will not want to watch it back again. Chelsea have failed to get into the game thus far with the home team looking far the more aggressive. Jorginho has made two fouls and looks off the high pace set. 02' Slavia Prague 0-0 Chelsea Chance! Slavia Prague have started well. Stoch's free-kick was whipped dangerously to Deli who headed just wide! Chelsea get this first-half underway sporting their traditional blue and white colours, kicking from right to left. The atmosphere, even with a capacity reduction, is electric! With Pedro and Willian on either wing, does this now show that Hudson-Odoi and Loftus-Cheek are part of Sarri's strongest Premier League outfit? Olivier Giroud starts in the Europa League as expected and will be fired up to grab his tenth goal of the campaign. Miroslav Stoch, a former Chelsea player, has impressed this season and starts on the right-wing. Chelsea will have a hard time trying to contain the tricky player. Felix Zwayer of Germany takes control of today's game. The stage is set... how lovely. NO HAZARD. The Slavia Prague defenders breathe a sigh of relief as the Belgium is rested on the bench. Here's how Slavia Prague line-up against Chelsea for tonight's Quarter-final clash. Since 2012, only Artiz Aduriz has scored over 10 goals in a single Europa League campaign. Could Giroud become the second? Slavia Prague have scored five goals in each of their last two games. Chelsea have only conceded four goals in the entire Europa League campaign. The last time Chelsea were knocked out of a European cup Quarter-final was in 2011 to Manchester United. What a view Chelsea have in Prague. "We are talking about a club that plays in the Premier League and challenges for trophies year in, year out. "Their qualities are indisputable, and I honestly think that Chelsea is the best defensive team in Premier League." Vladimir Coufal - defender or training cone? "Hazard can turn five defenders into training cones in a second. "Nevertheless, I will try to make things difficult for him. "We are extremely saddened by the fact that three of our sectors will be closed. Hopefully, it will be a lesson for everyone involved and such a situation will never happen again." Well... there isn't any. This will be the first competitive meeting between Slavia Prague and Chelsea. Anything could happen. There is a first time for everything! Team News – 'tired' Hazard may not start! That’s right, the same man who practically won Chelsea their most recent match against West Ham United may not start. Sarri has said that the Belgium is ‘tired’ and with Liverpool just three days away, it is very possible he will be rested. Giroud is expected to lead the line for Chelsea; he scored a perfect hat-trick in their last Europa League match against Dynamo Kiev. Slavia Prague have no injury issued to report but will be without the services of midfield talisman Tomas Soucek who serves a one match ban. It would be fair to say that Slavia Prague haven’t performed too well against English sides I years gone by. Of their previous nine encounters against English sides, they have won just one against Leeds United in 2000… and they still went out of the competition on aggregate score. That was, in fact, their last Europa League Quarter-final match-up. They have only managed to get into the Semi-final on one occasion after beating Roma in the 1995-96 season. Times may have changed though; the Czech champions sit top of the league and haven’t lost in 10 matches in all competitions highlighting the seriousness of the Blues’ competition tonight. “We need to be careful because this is a very dangerous match for us. Chelsea travel to the Czech Republic in what has already proved to be an exciting and equally successful Europa League campaign thus far. It is no secret that Chelsea would rather be playing in the Champions League, but the competition has provided a great service to them this season. It has allowed players like Ruben Loftus-Cheek and Callum Hudson-Odoi a way into the first team and a chance to show just how effective they can be. So too, Olivier Giroud who has been more impressive than the lot; he is the competitions top scorer with nine goals. However, Chelsea have been equally impressive at the other side of the pitch in recent weeks. They have conceded just once in the last three Premier League fixtures. It will have to be equally impressive tonight as Slavia Prague have scored 10 goals in their last two games.